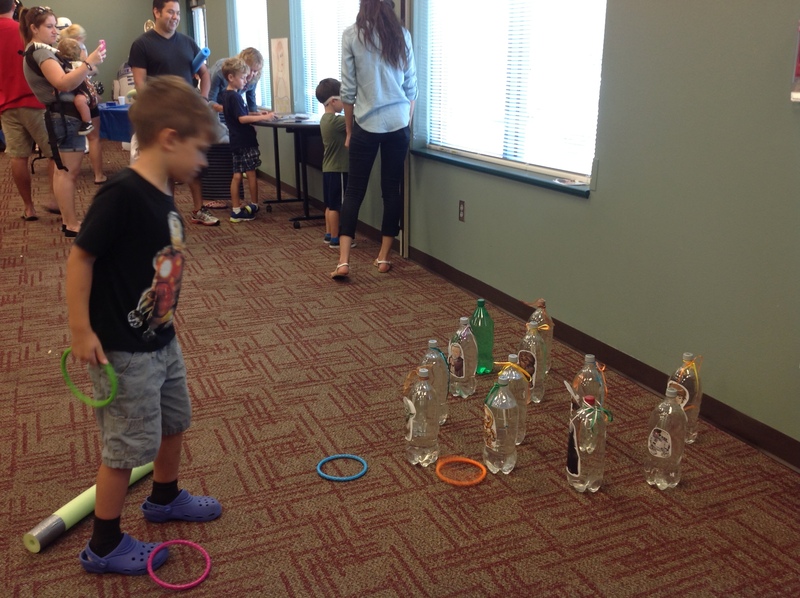 Since our kids’ Summer Reading theme this year is “Fizz, Boom, Read,” we thought having a super messy version of “Yuck @ The Library” would be a perfect fit! 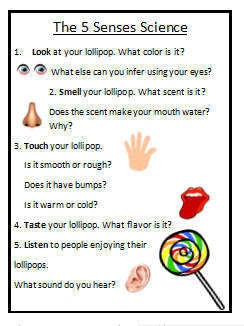 Our focus this week was the five senses, so we tried to center our activities around this concept. 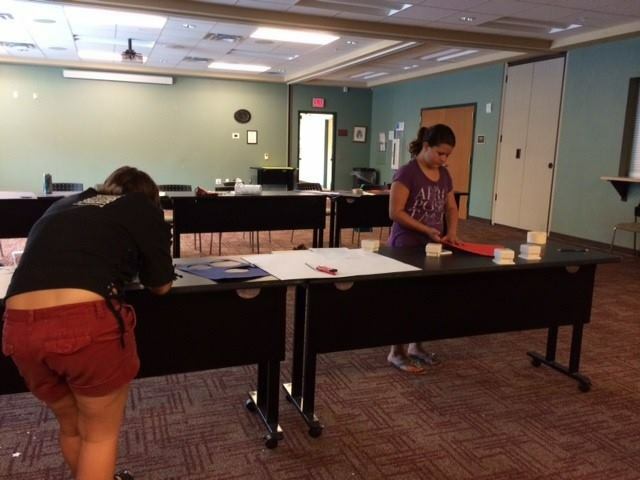 Step 1: Story Time To open our program, two of our teen volunteers read Five for a Little One by Chris Rashka. It’s a very lyrical, rhythmic picture book that describes the five senses in a fun and accessible way. Step 2: Luscious Lollipops Activity To further incorporate the five senses, as well as a literacy component, we had the kids participate in our “Luscious Lollipops Activity.” We gave each child a pencil and a special card with a lollipop attached. We then asked the kids to examine their lollipops, using their senses, and use adjectives to describe their observations. 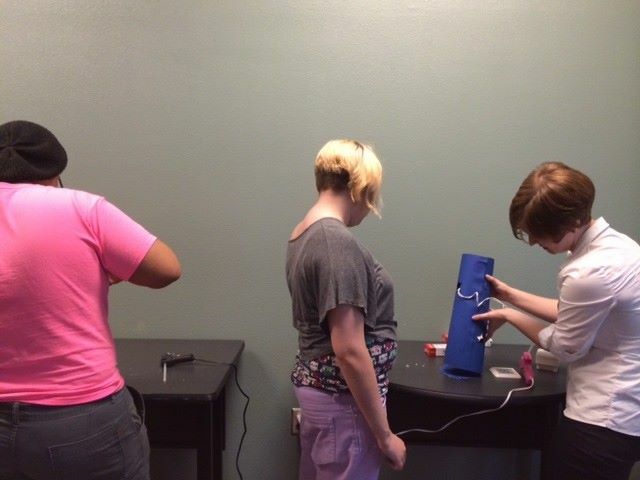 Next, we had the kids use their senses of touch, sight, and smell in our Elephant Toothpaste Experiment. The directions for this activity can be found on ScienceBob.com. I highly recommend using stations for this activity. Also make sure each child has gloves to protect their skin from the chemicals. We started by explaining two scientific terms: catalyst and exothermic reaction. Then we had the kids move to the stations and begin creating their mixtures. 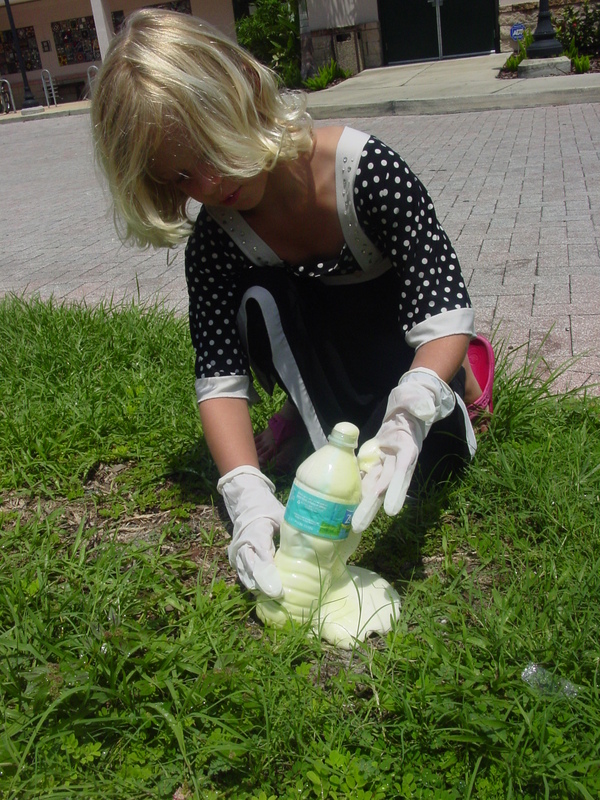 Once our kids had created their chemical concoctions, we took them outside to enjoy the final reaction. Needless to say, they enjoyed the bubbly, foamy, mess we made. 🙂 We also made sure to have them touch the bottles while the exothermic reaction was occurring so they could feel the heat it generated. Step 4: Oobleck Experiment Finally, we asked our kids to rely on their sense of touch during our Oobleck Experiment, which, of course, gets its name from Dr. Seuss’ Bartholomew and the Oobleck. The directions for creating an Oobleck can be found on the Scientific American website. 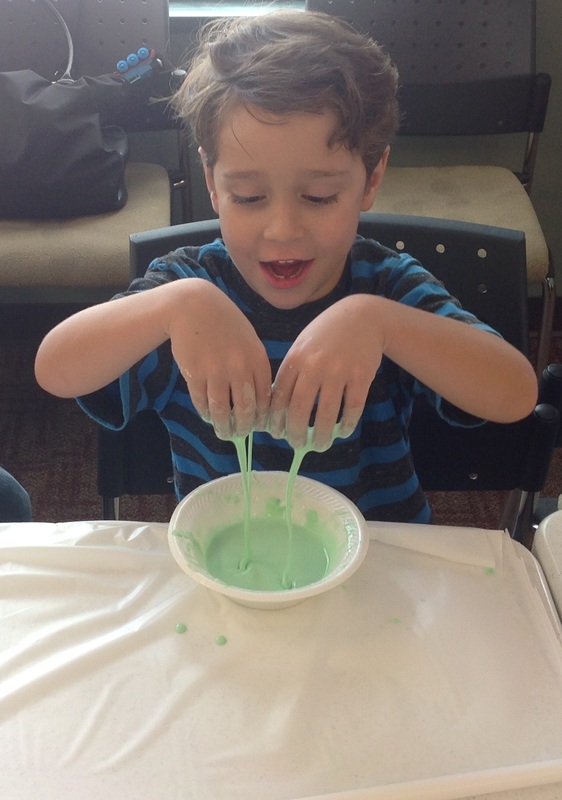 Oobleck is particularly fascinating for kids because it’s a non-Newtonian fluid. In other words, it’s a fluid that can act both as a liquid and a solid. It all depends on how much force you apply at any given time. We encouraged the kids to experiment by applying varying amounts of force. Ex: “What happens when you touch the Oobleck gently? What happens when you poke it as hard as you can?” Our kids had a wonderful, gloppy time playing with their slimy creations. At the end of the program, we gave them all ziplock baggies so they could take their Ooblecks home. 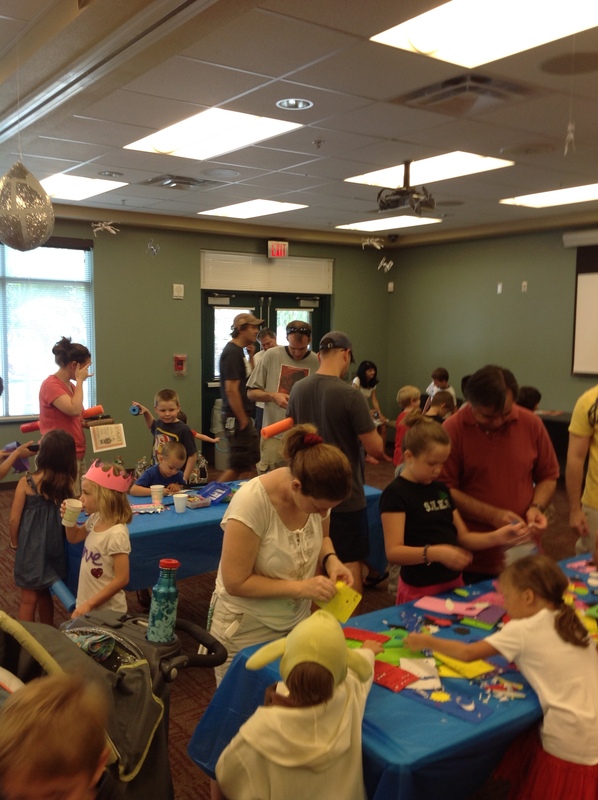 In total, we had 30 kids and 8 parents attend this program. 🙂 We’re all looking forward to having another messy science day again soon! We did it! 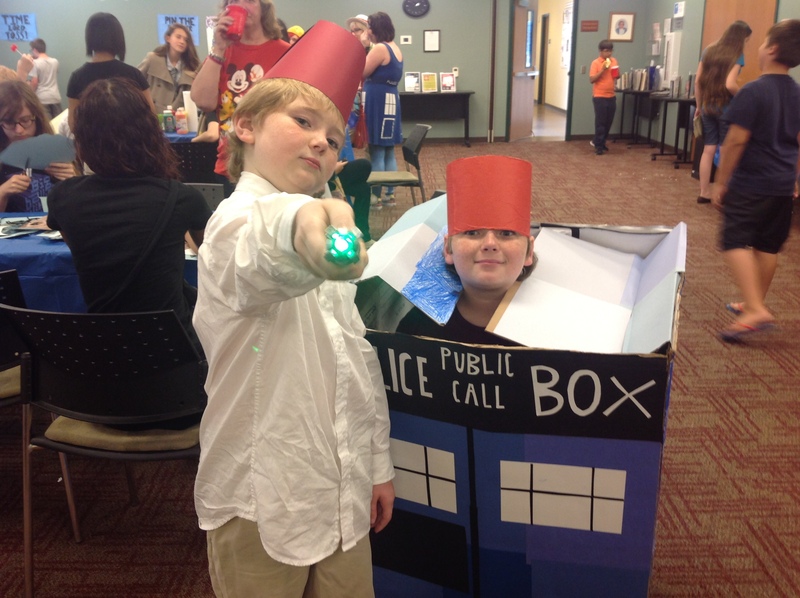 After over a month of preparation, hours of painting, printing, and planning, our “Doctor Who Day” was a complete success! 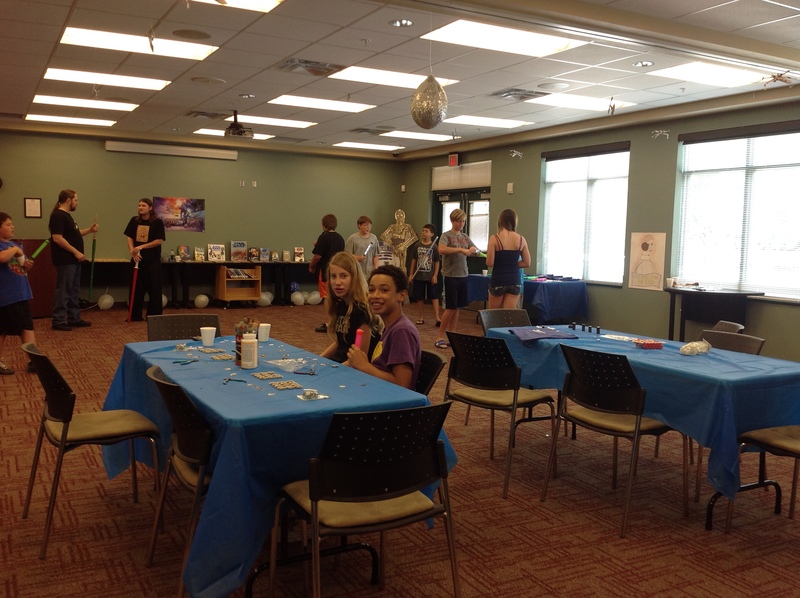 We had 54 tweens, teens, and their parents attend our event. 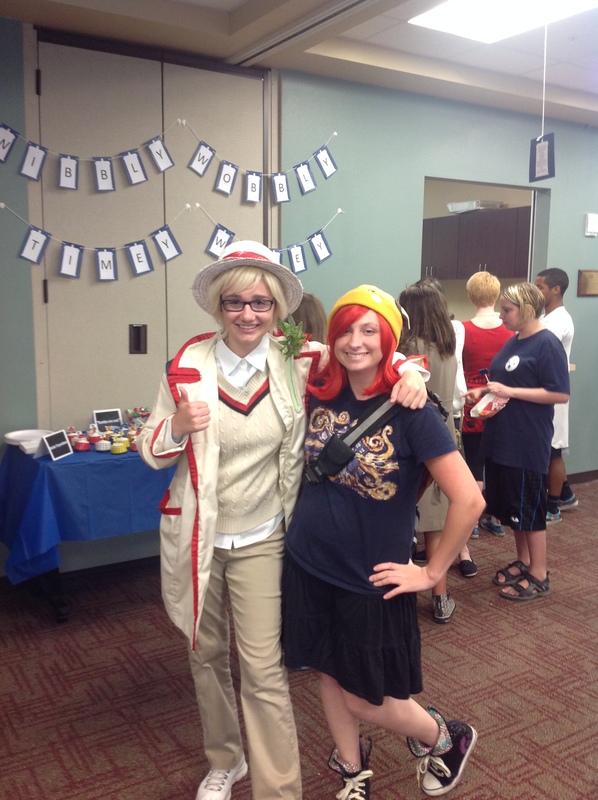 Many came in costume, dressed as their favorite Doctor or Companion. 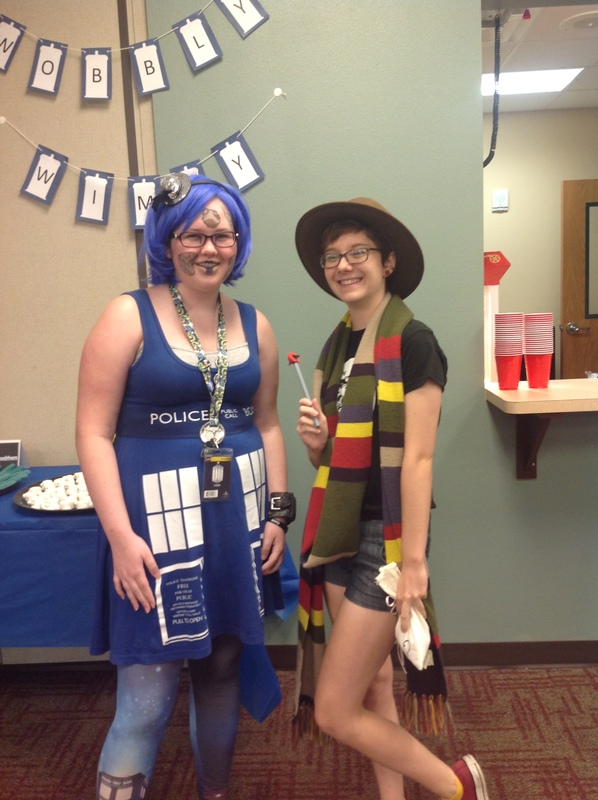 At the end of the day, we raffled off all seven seasons of Doctor Who. 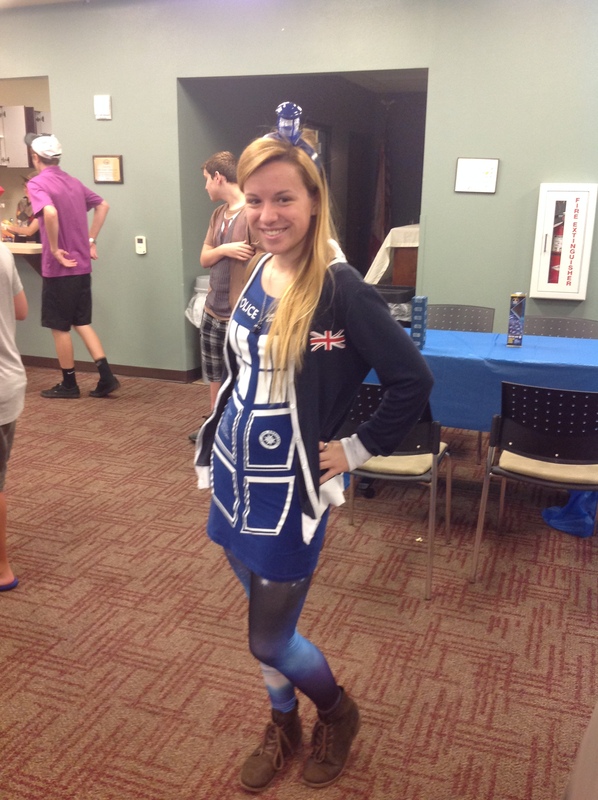 We also raffled off a TARDIS mug as a runner-up prize. As always, I wanted this event to feel immersive. I tried to include as many specific details from the series as possible. 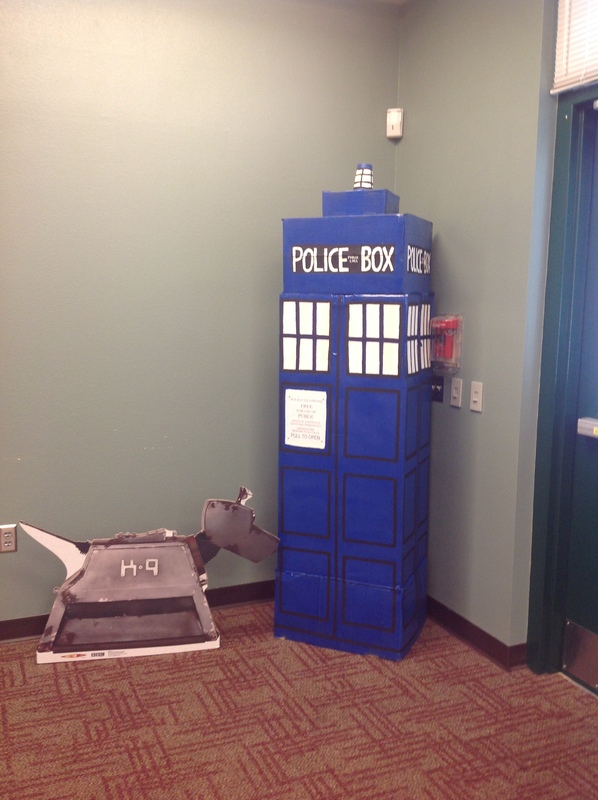 Most of my decorations were inspired by various Doctor Who episodes, including our “Badwolf” and “Cassandra” posters, as well as our K-9 and Weeping Angel standees. 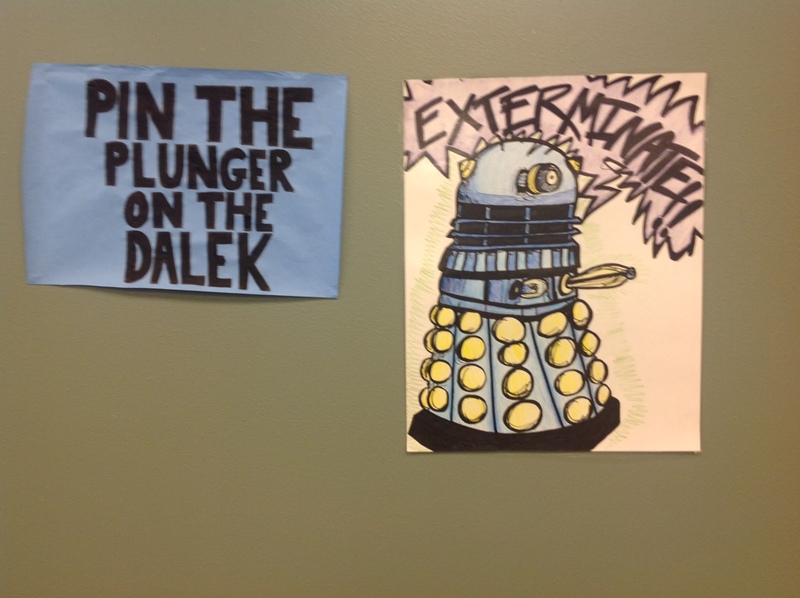 We also hung a number of famous Doctor Who quotes from the ceiling. 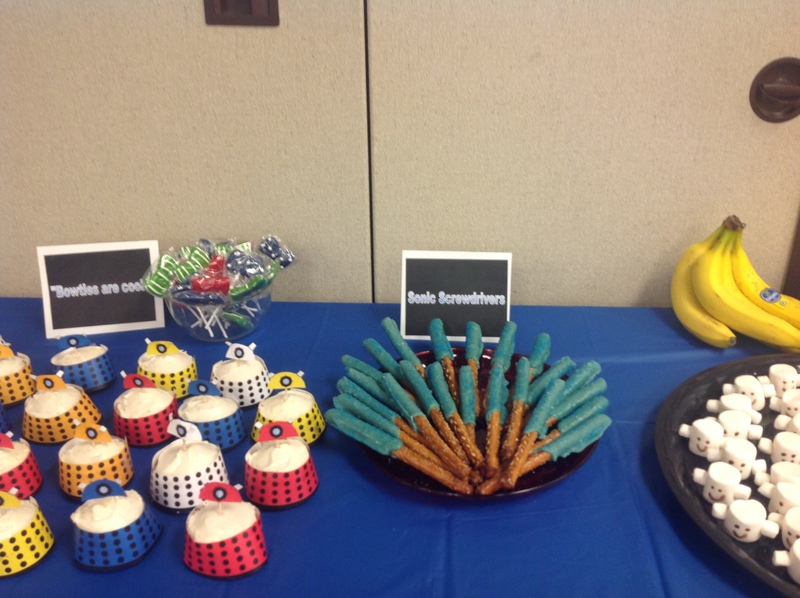 We had four main dishes at our Doctor Who program: Sonic Screwdrivers (chocolate covered pretzel rods), Adipose Babies (marshmallows), bananas (because, as the Doctor said, “Always bring a banana to a party”), and Dalek cupcakes. The cupcake wrappers were ridiculously cute and can be found on Deviant Art. We also had bow-tie shaped lollipops from Oriental Trading, as well as popcorn. 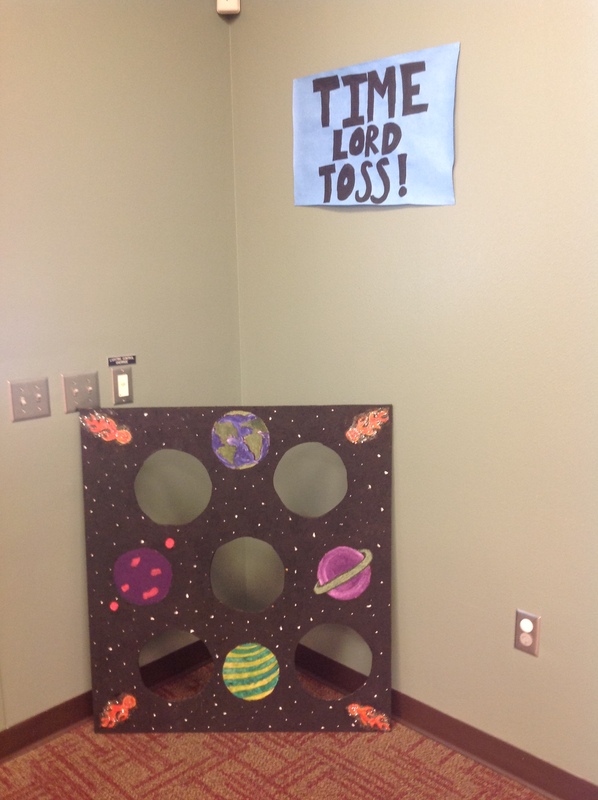 I wanted to make sure we had plenty for our teens to do. 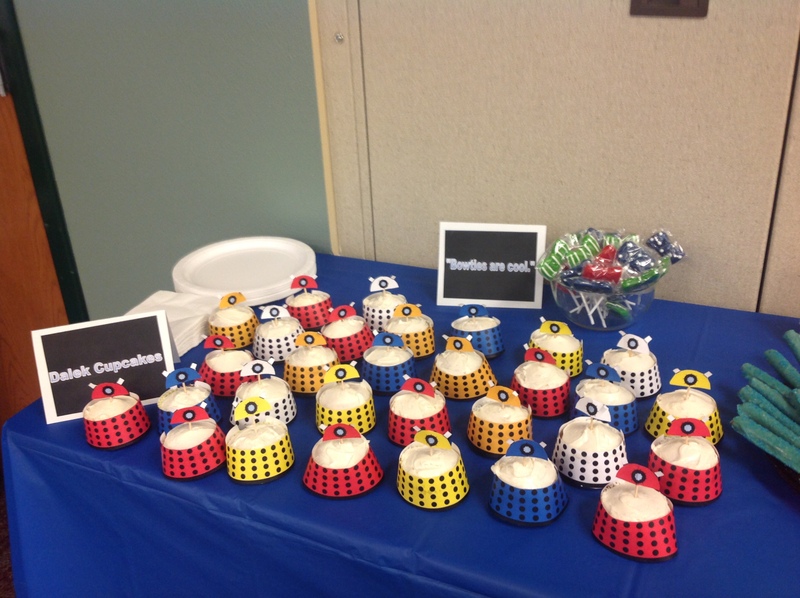 So I came up with several crafts for them to enjoy. 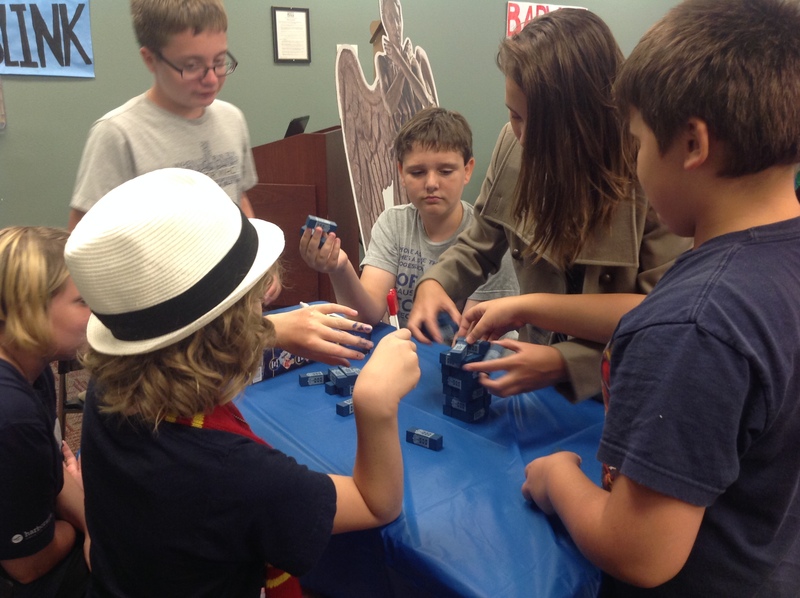 I wanted to provide a variety of games for our teens to enjoy. 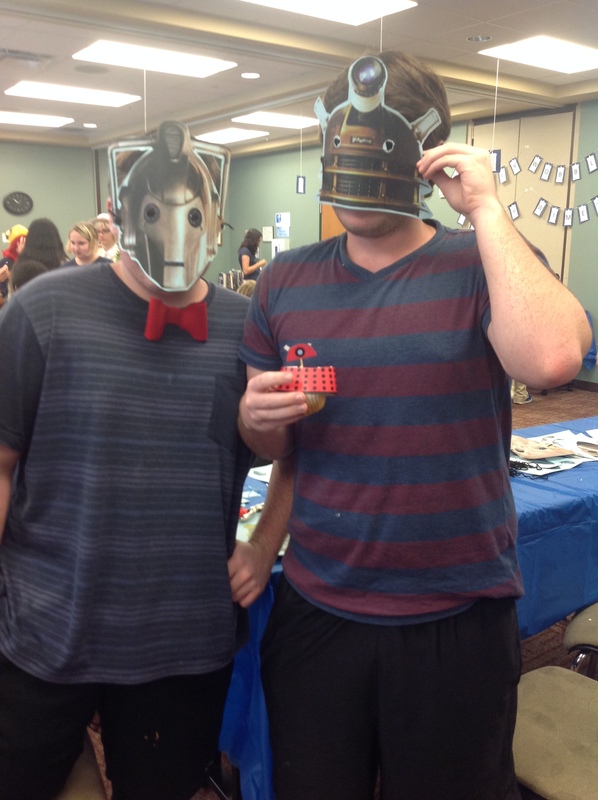 So we had two board games: Doctor Who Jenga and Doctor Who Yahtzee. At the end of the day, everyone had a fantastic time. 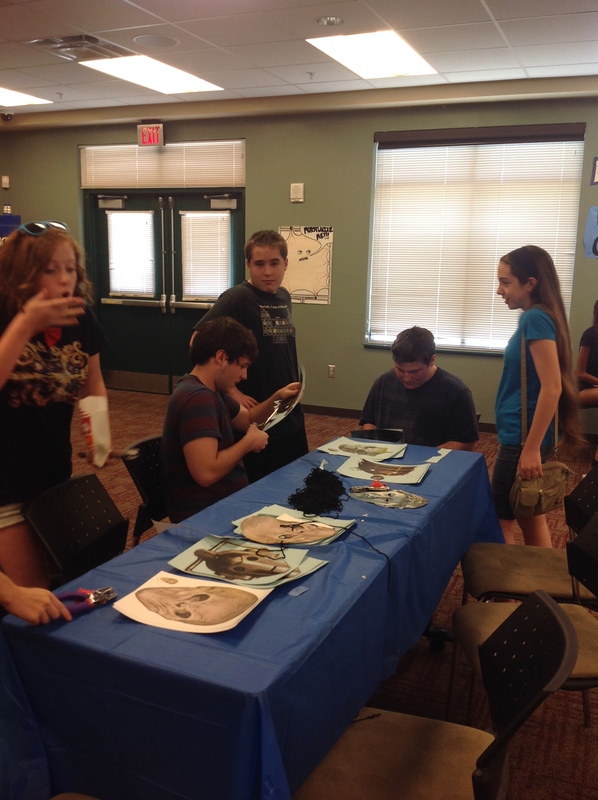 This was our best attended teen event yet. 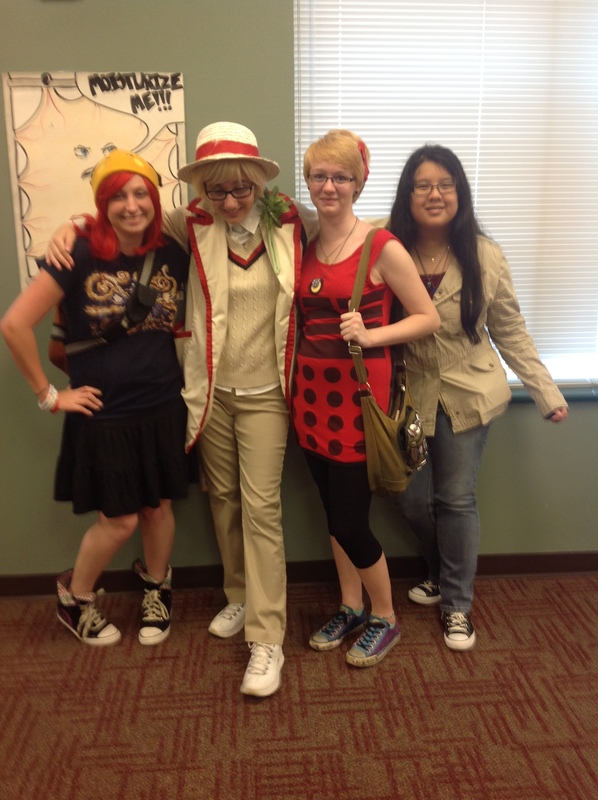 Here’s to the Doctor! Allons-y! Running to catch the Doctor! 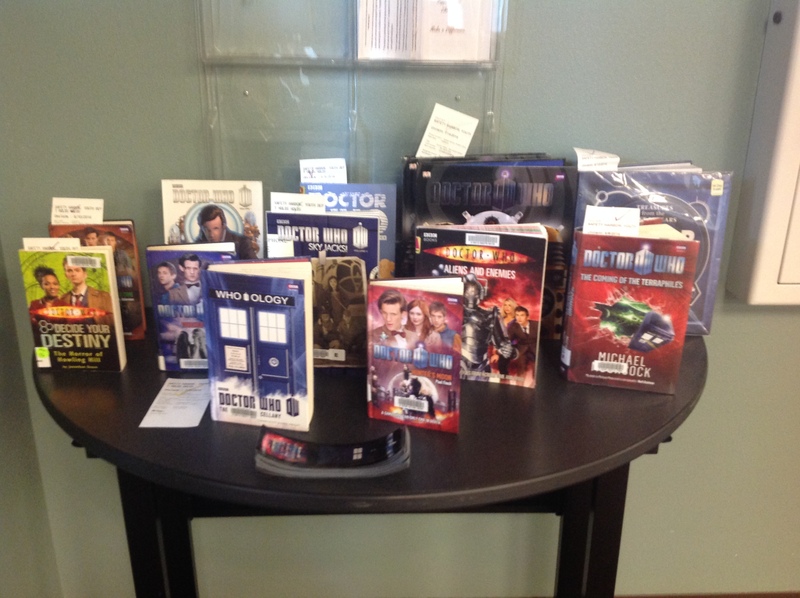 Tomorrow is “Doctor Who Day” at our library, which means a swarm of tween and teen Whovians will be descending on our library. 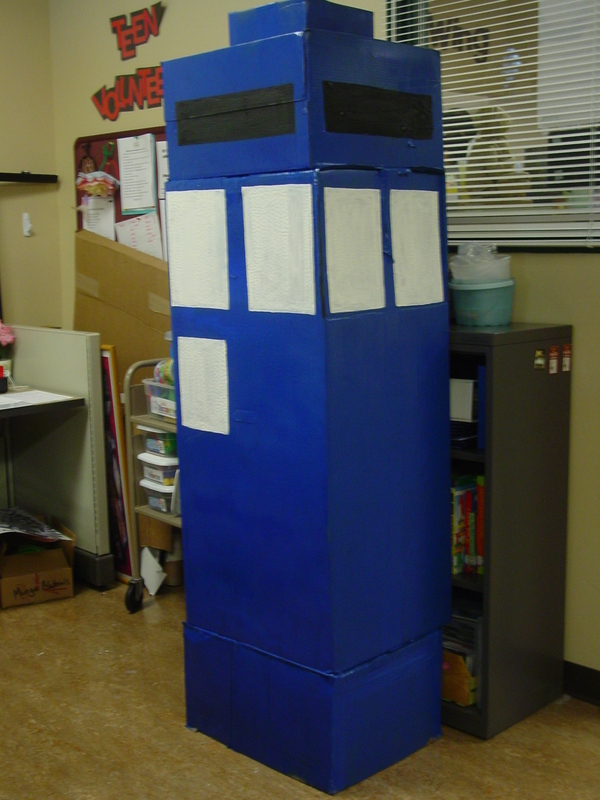 So I thought I’d create a TARDIS for the kids to pose and take pictures with.The process of making the TARDIS is actually pretty simple. It just takes a lot of time and patience. And a lot of paint. 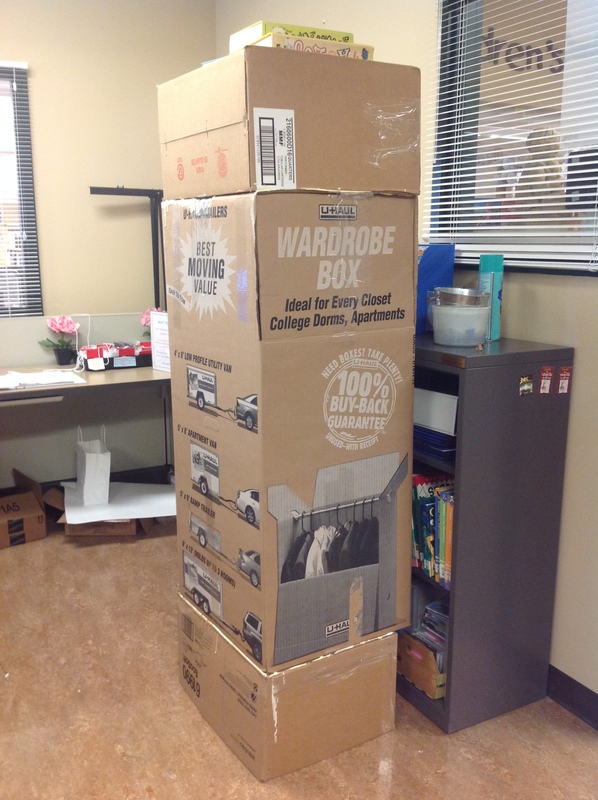 If you’re using multiple boxes like I did, simply stack them on top of each other. Then adhere them using the wood glue. Note: You may want to use some books or other heavy objects to press the boxes together until the wood glue dries. 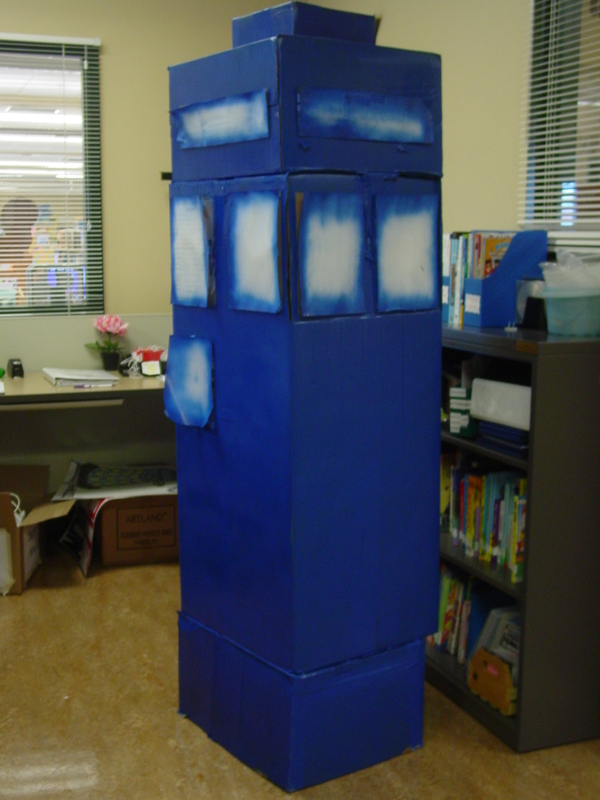 Using scrap paper that I cut to size, I taped of the sections of the TARDIS that I knew weren’t going to be blue: the windows, signs, etc. By covering these sections, it protected them from the spray paint so that it would be easier to paint them another color later. After removing the paper, I painted the remaining large sections: the windows, the signs, etc. Make sure to take your time here. Multiple coats might be required to get the colors right. After the base coats were completed, we added the final details: the bars on the windows, the words on the signs, etc. 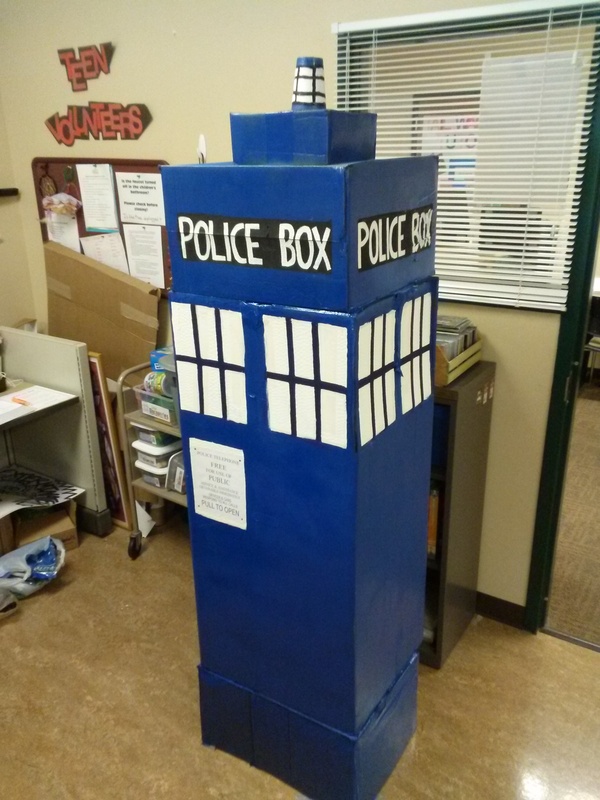 We even painted a styrofoam cup to look like the lantern on the original police box. 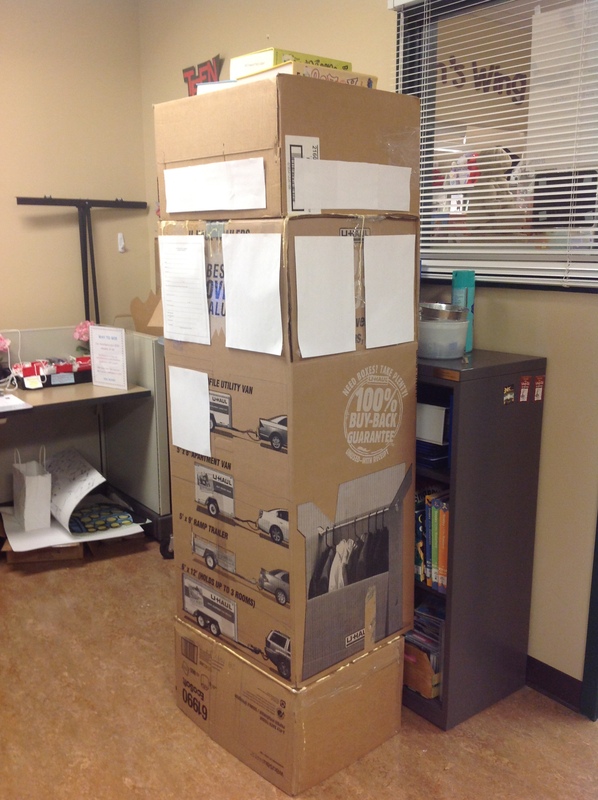 We then glued the cup to the top of the boxes and presto! 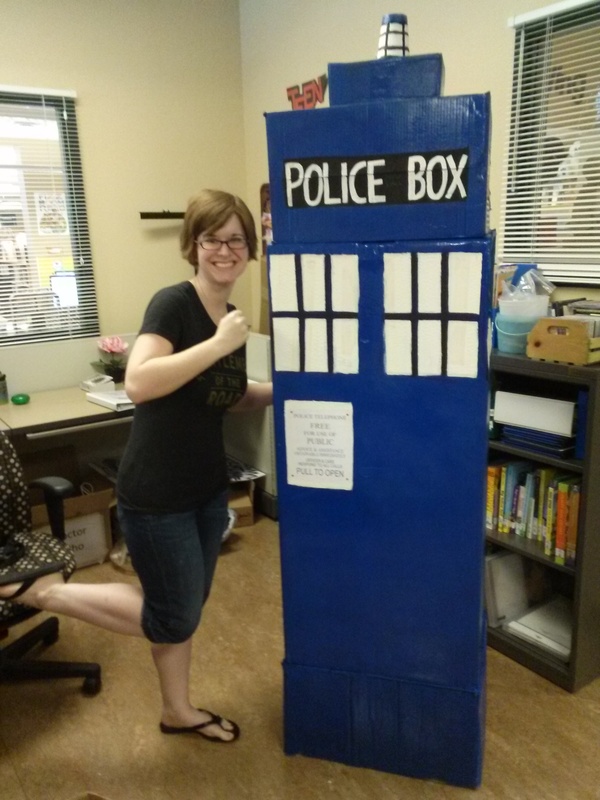 Insta-TARDIS! 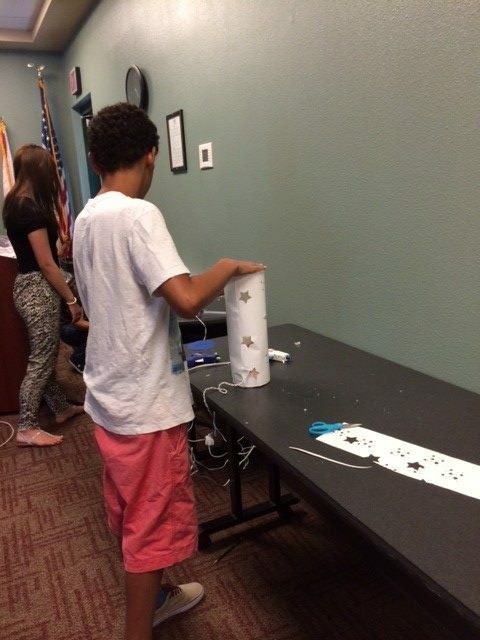 As part of our Teen Summer Reading Program, “Spark a Reaction,” I thought a craft featuring electricity would be a perfect fit! This craft is fairly simple and user friendly. Plus it will cast beautiful designs on your wall in a dark room! Cut out the pieces you measured. Punch as many stars as you like into the poster board. Hot glue the lamp “body” to the wooden box. 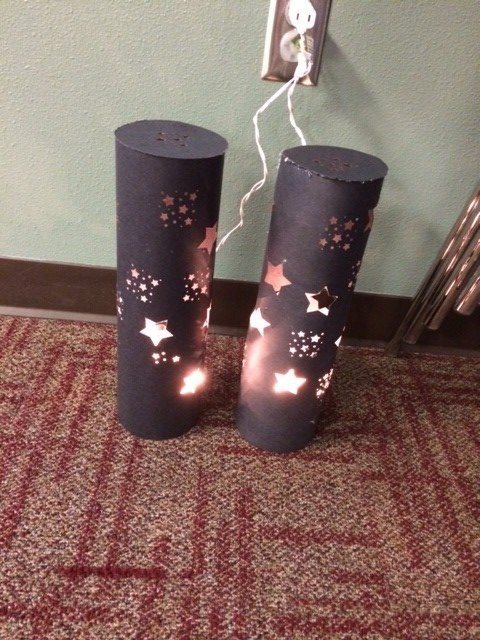 Drop your Christmas lights into the lamp and thread the cord out through any stars you have in the back. 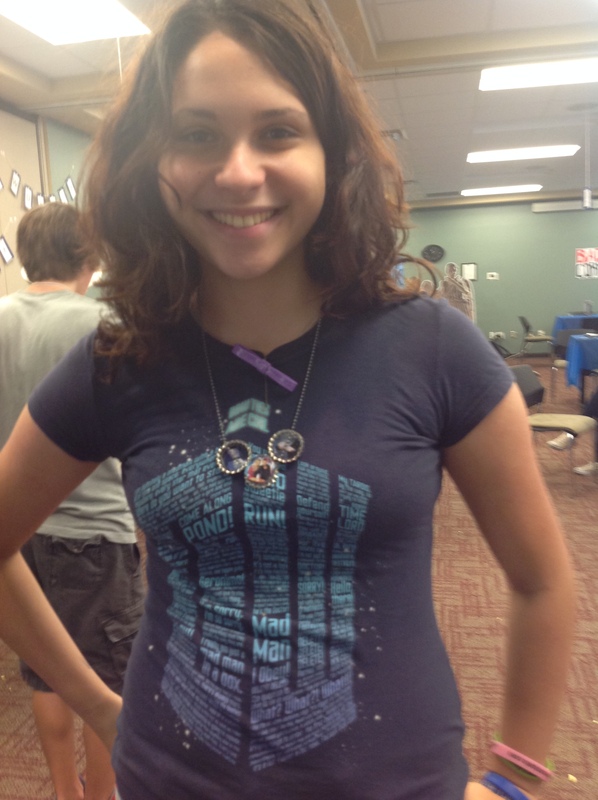 Then hot glue your “top” on. Step 4: Plug it in and enjoy! 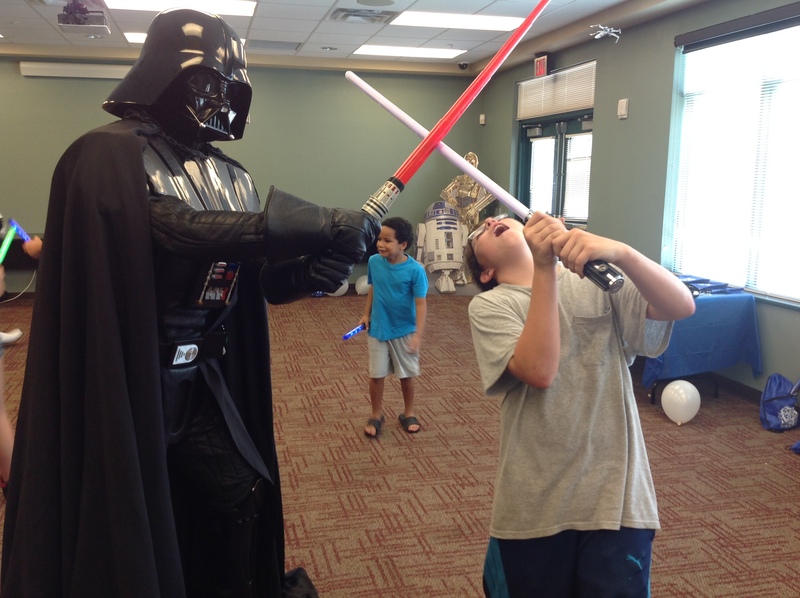 Our Summer Reading Program for both kids and teens this year is science-based, so what better way to encourage an interest in science than by tapping into one of the greatest sci-fi stories of all time: Star Wars! 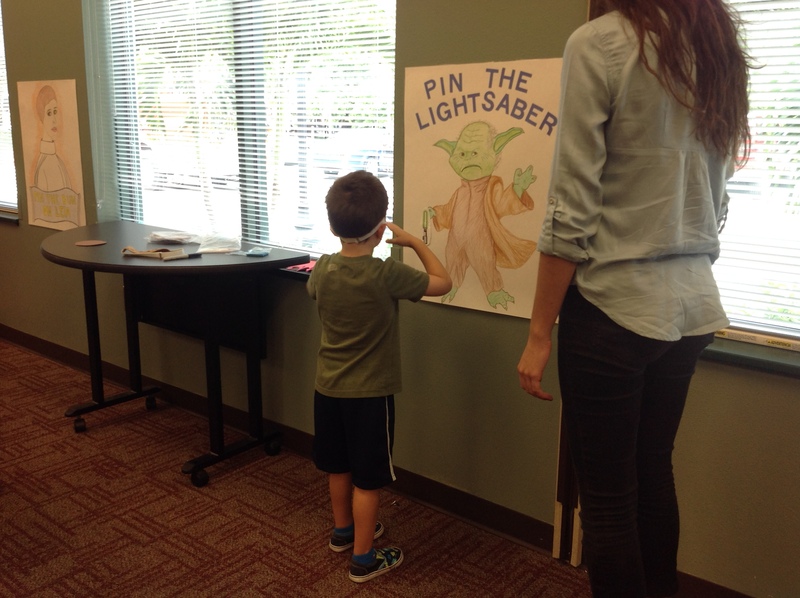 We decided to make Star Wars Day a multi-age event, with programs for little ones in the morning and activities for tweens and teens in the afternoon. 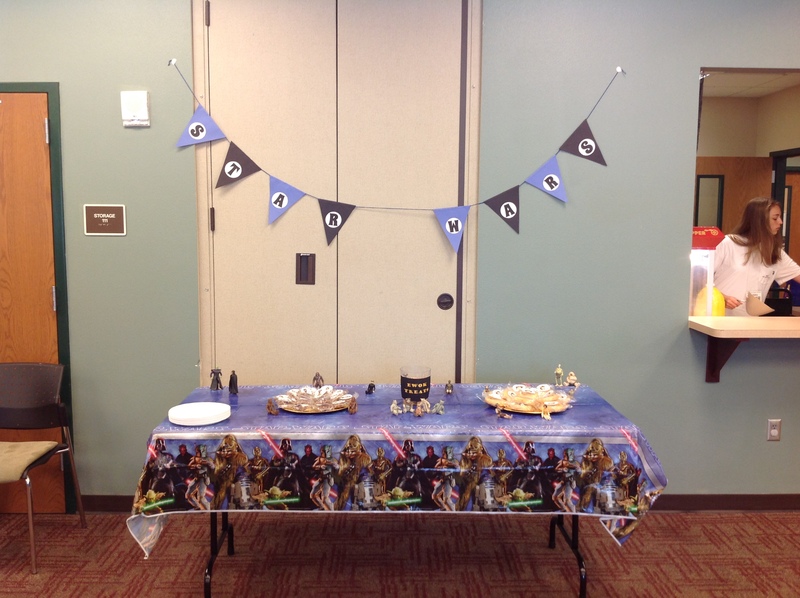 In essence, we hosted an all-day Star Wars book bash. 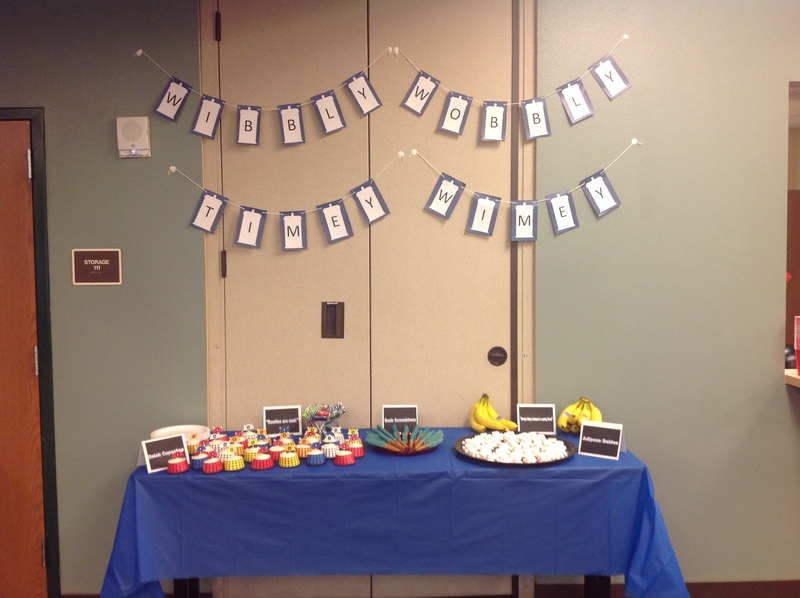 Other decorations included blue and black star balloons and a homemade pennant banner. And, by some strange stroke of luck, my boyfriend’s mother stumbled across his childhood Star Wars action figures, which we used to help add character to each of our tables. 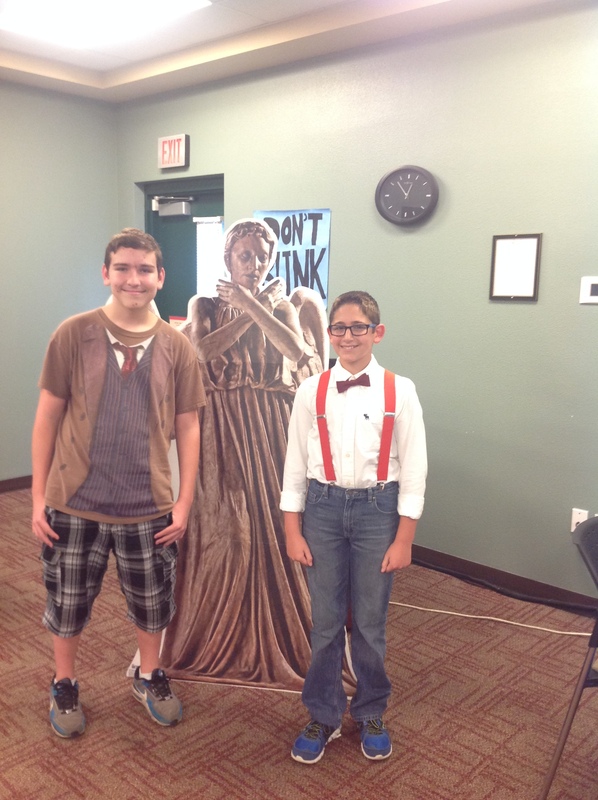 And, of course, we had cardboard standees of R2D2, C3PO, and Yoda. 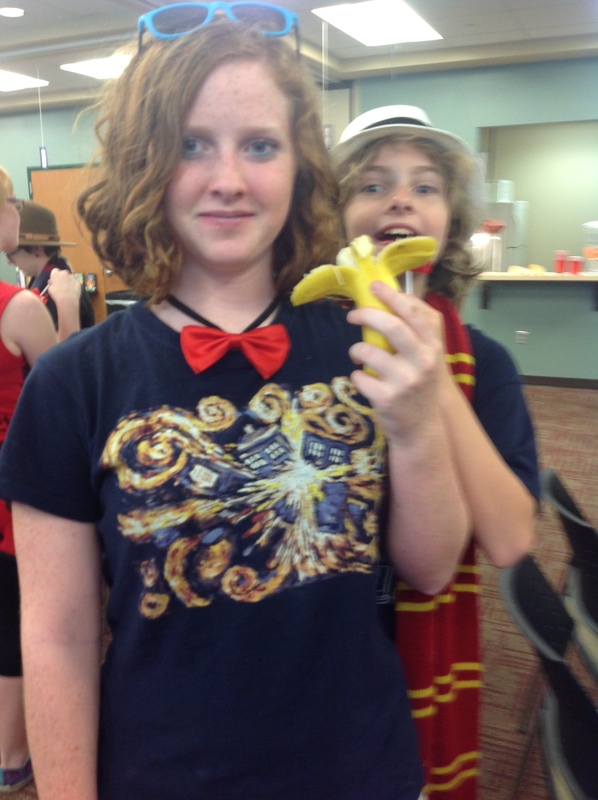 We wanted the food to be as “themed” as possible, but with a limited budget and time constraints we had to get creative. So I hunted through Pinterest, naturally, and found dozens of cute ideas. 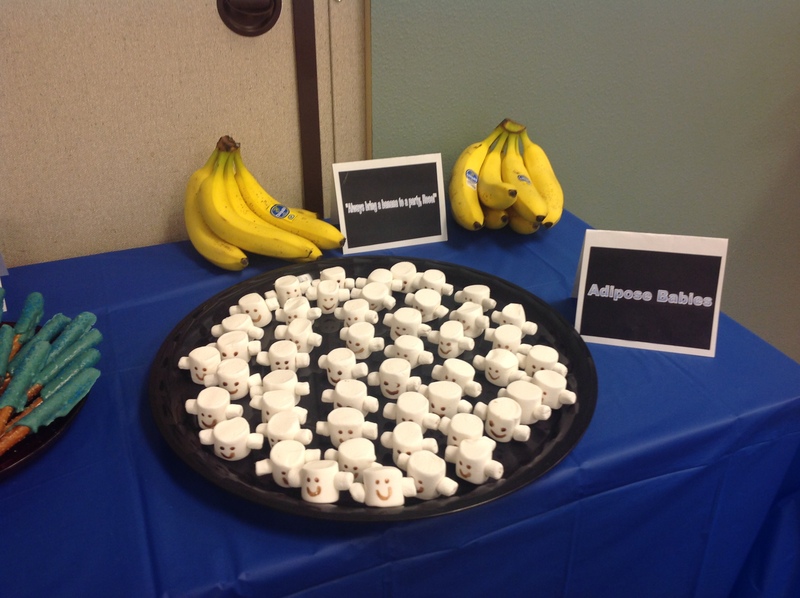 I used Microsoft Publisher to create custom labels for all our foods. 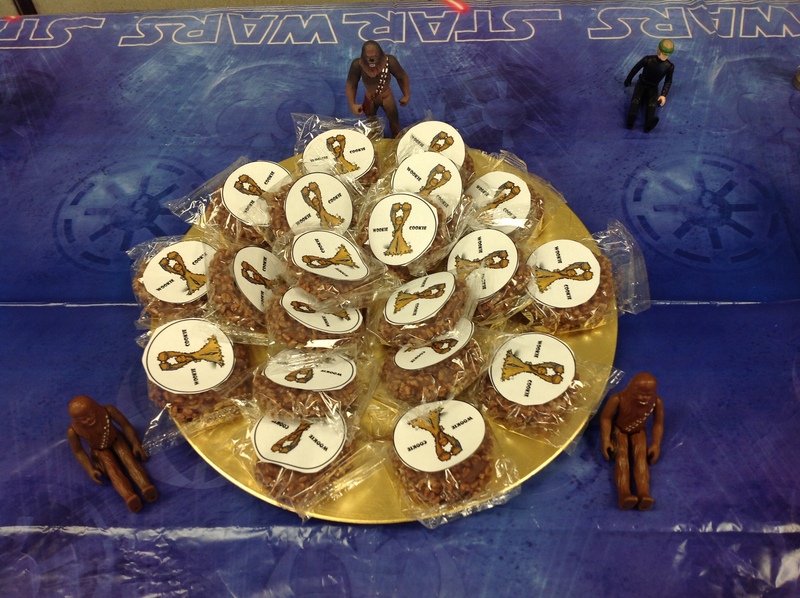 We ended up going with Wookie Cookies (Star Crunches), Leia Buns (Honey Buns), Ewok Treats (Teddy Grahams), and Thermal Detonators (Whoppers). 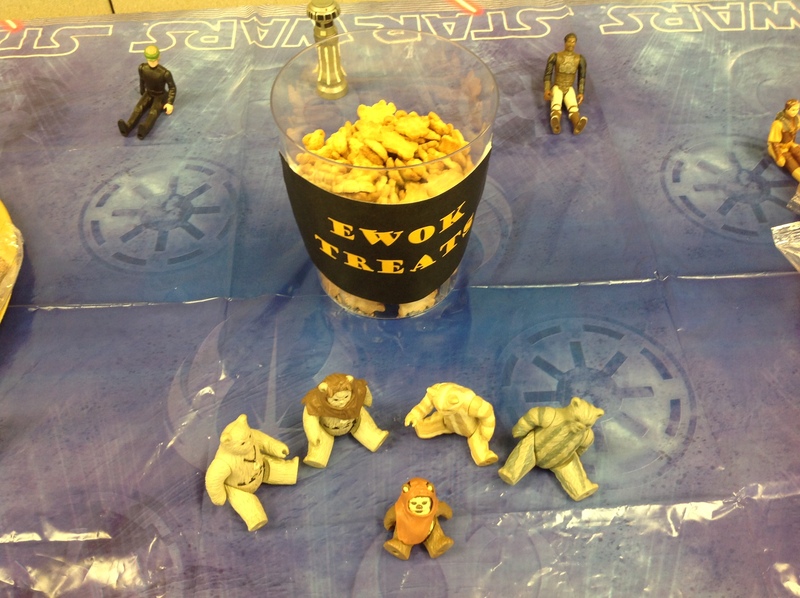 We also had popcorn and Yoda Soda (Mountain Dew) for the older kids. 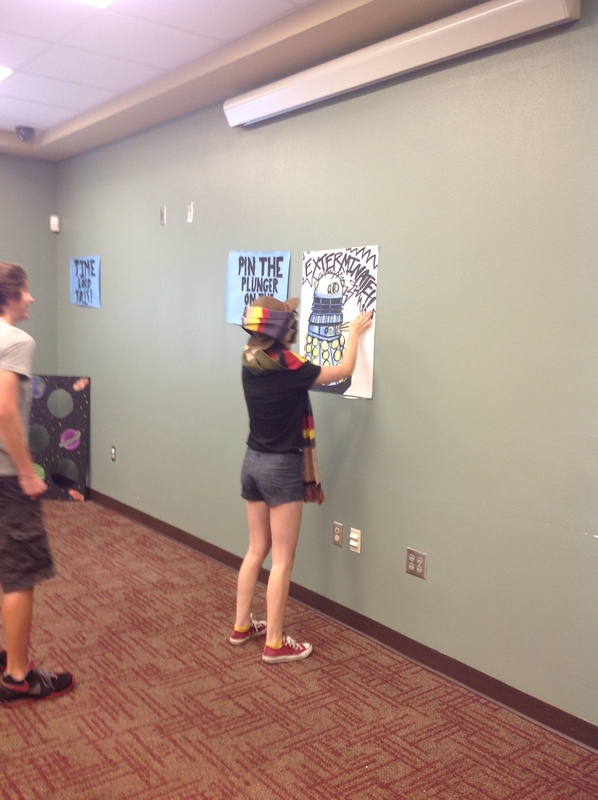 We had two posters drawn up by some of our lovely teen volunteers so that the kids could play “Pin the Bun on Leia” and “Pin the Lightsaber on Yoda.” We also had a Star Wars Ring Toss, in which we taped printed images of various characters on to 2 liter bottles and lined them up. I borrowed this idea from Kelly on Here Comes the Sun. 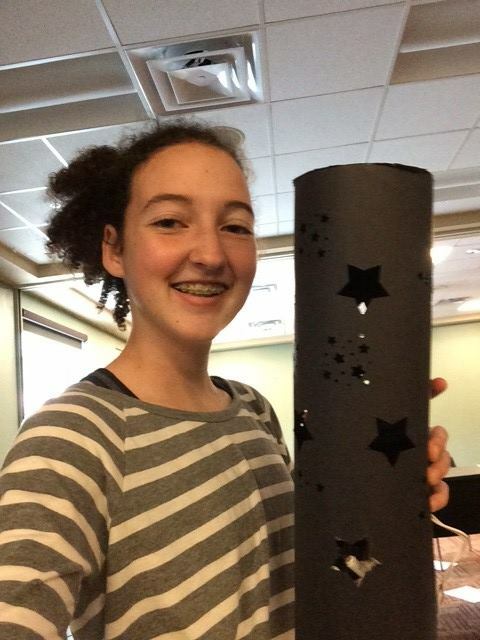 Her DIY lightsaber idea has been shared numerous times on Pinterest. So easy. So brilliant. Grab a few pool noodles, cut them in half, wrap the ends in duct tape and voila! Instant, kid-safe lightsaber. 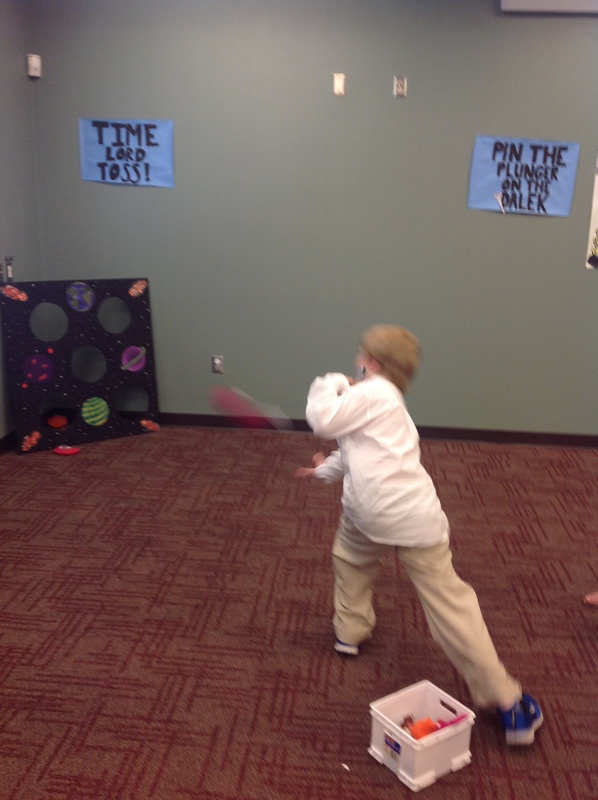 We decided to kick things up a notch by putting our padawans through their paces at the Jedi Academy. We blew up about twenty balloons (no helium) and gave one to each child. Then, after counting to three, we had the kids throw the balloons in the air! 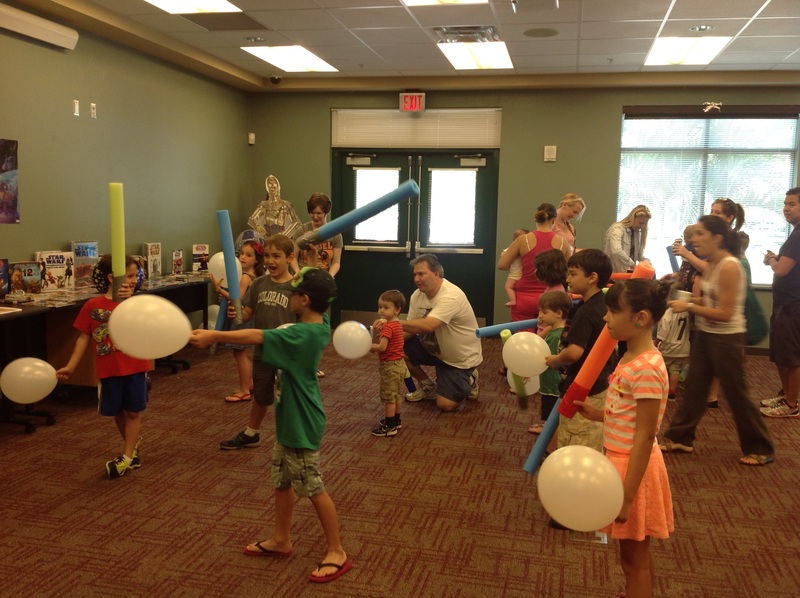 The kiddos then had to keep their balloons in the air for two minutes using only their lightsaber. 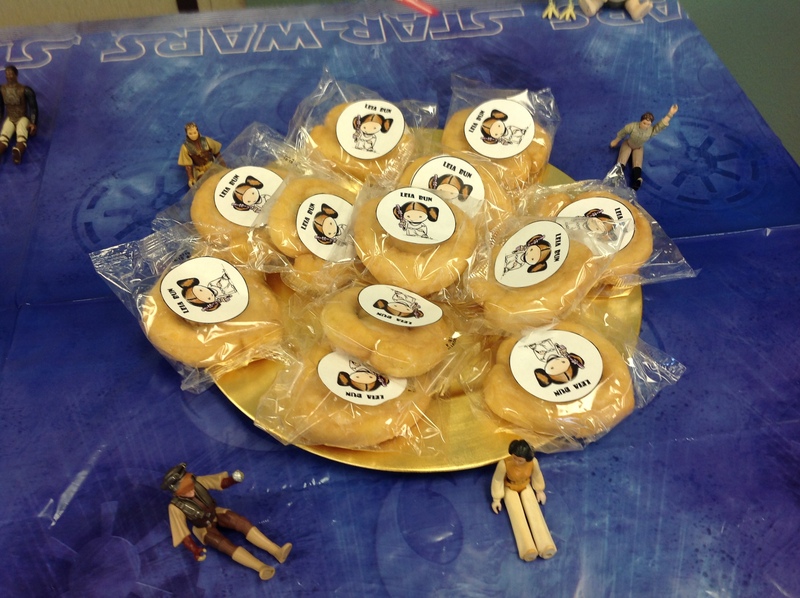 When they finished, each child got a Jedi Knight Certificate and a piece of candy. Simple, easy, and effective. 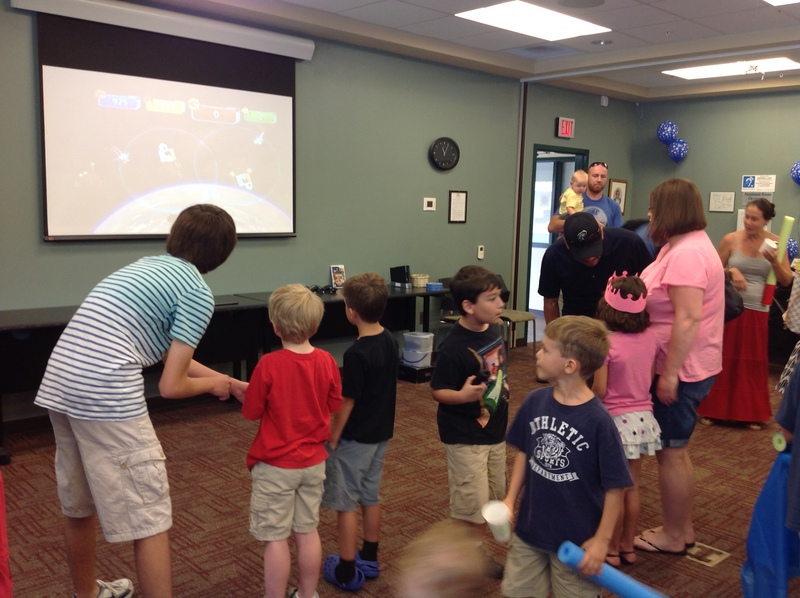 We hooked our Wii system up to the projector and let the kiddos go to town on Lego Star Wars and Star Wars Angry Birds. 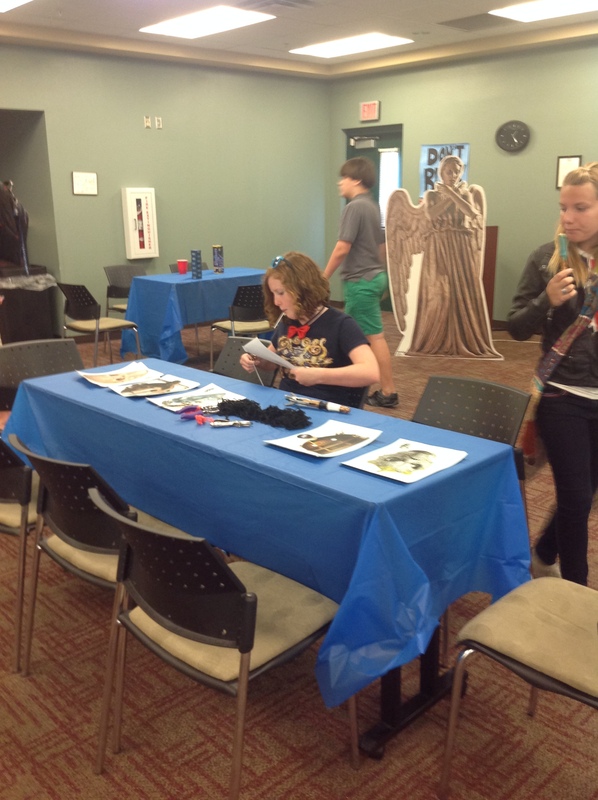 These crafts and dozens more can be found in the Star Wars Craft Book, which proved to be an invaluable resource while planning this event! I wanted the teen program to be “edgier” than the one we provided for the kids, so what better way to spice things up than with a professional sword fighting lesson? 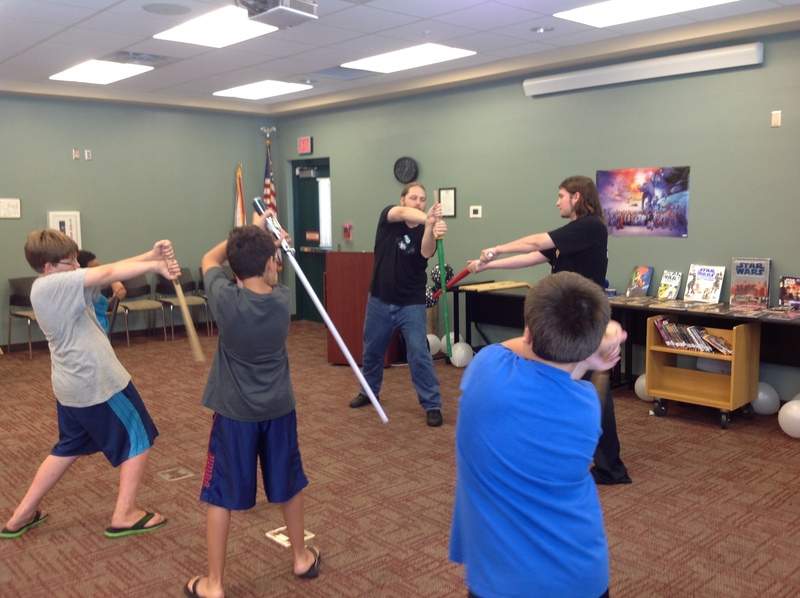 Paul Stonebridge, a local librarian who happens to be skilled in swordsmanship and martial arts, graciously came to our branch to teach our tweens and teens. They learned the eight basic sword fighting moves and four basic blocks commonly used in the movies. 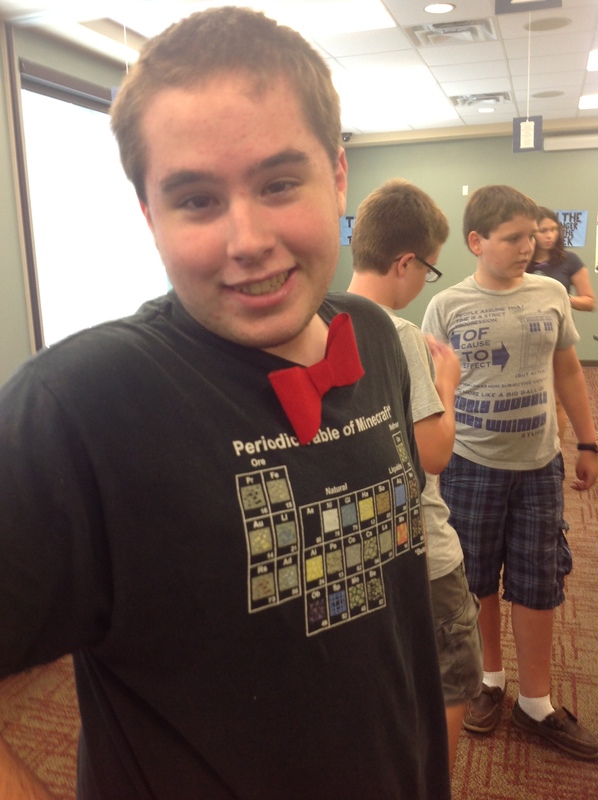 The teens had an absolute blast. We’re extremely grateful to Paul for making our event so special. 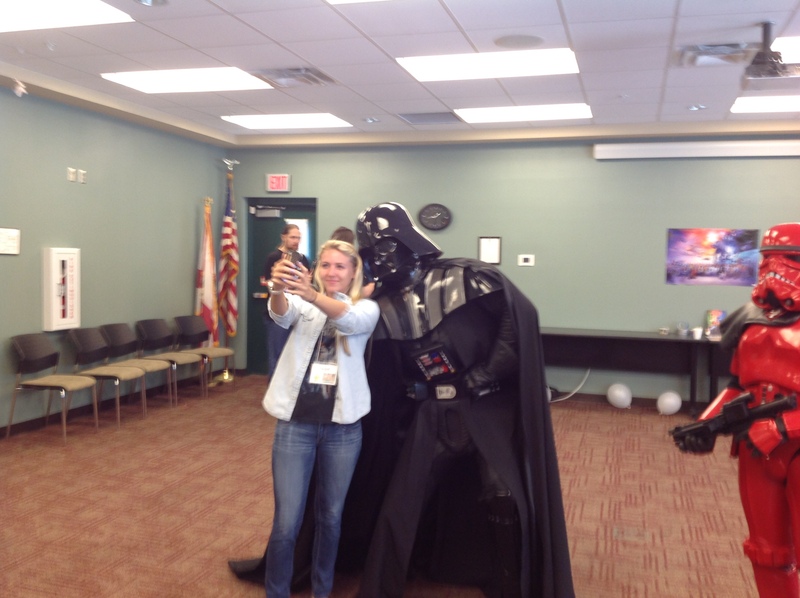 Even Darth Vader enjoys the occasional selfie. 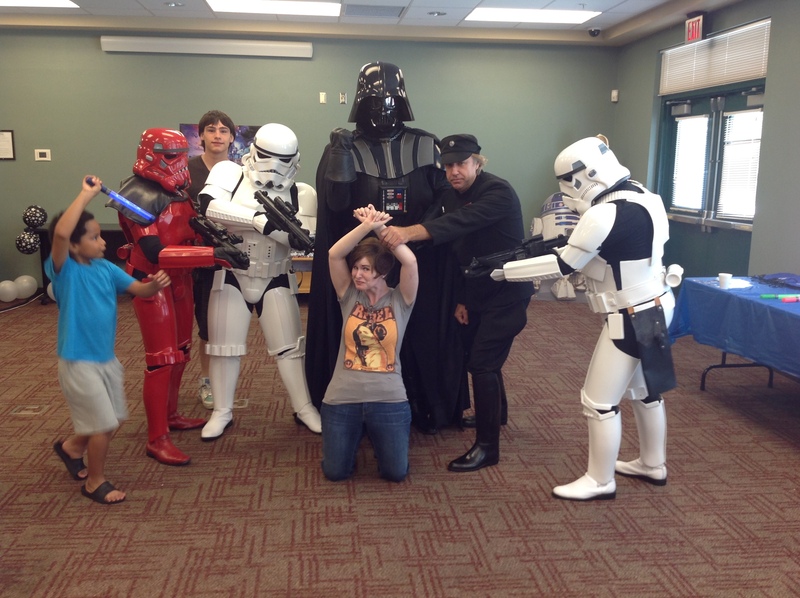 The 501st came to our branch free of charge and posed for pictures, interacted with our patrons, and answered Star Wars questions. 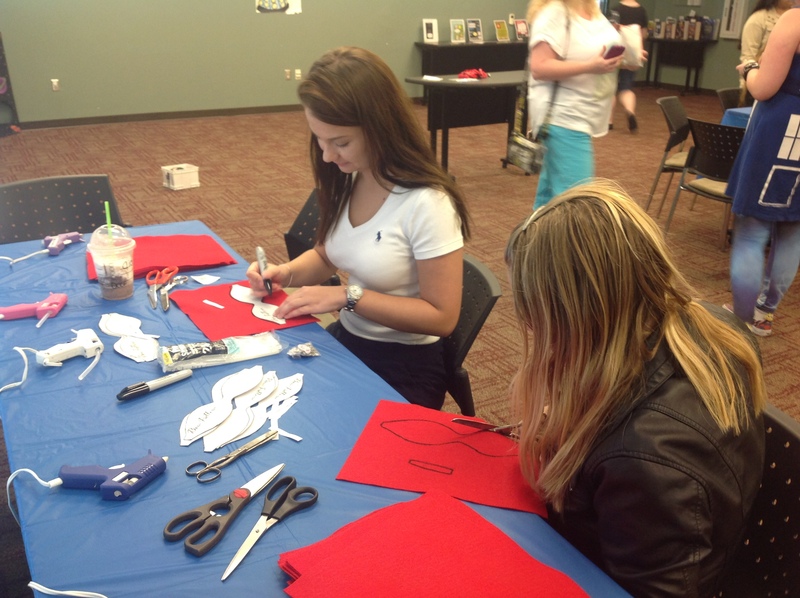 Our event would not have been the same without them! They were a simply phenomenal addition to our program. 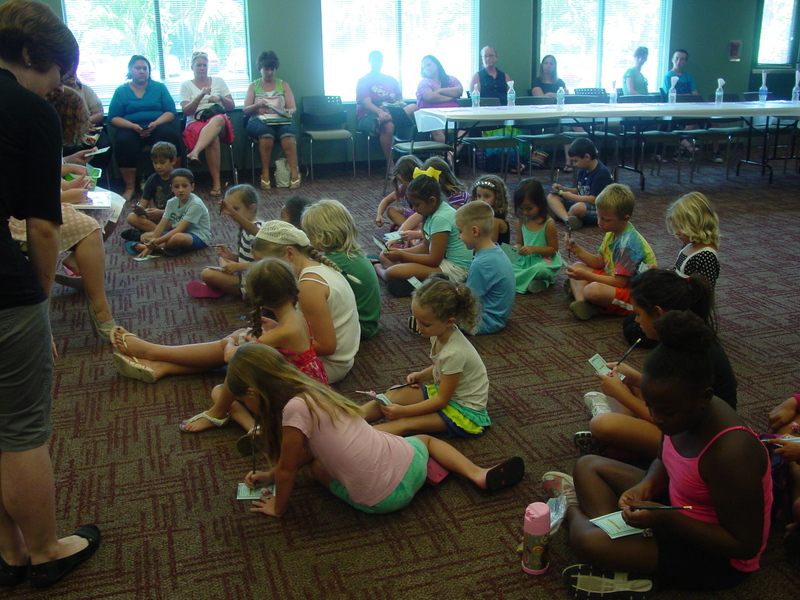 In total, we had over 120 patrons attend this program – not bad for a small library! We had a fantastic time and we can’t wait to do it again.